The 193-Member United Nations General Assembly formally adopted the 2030 Agenda for Sustainable Development on 25 September 2015, along with a set of bold new Sustainable Development Goals, which Secretary-General Ban Ki-moon hailed as a universal, integrated and transformative vision for a better world. “The new agenda is a promise by leaders to all people everywhere. It is an agenda for people, to end poverty in all its forms – an agenda for the planet, our common home,” declared Mr. Ban. 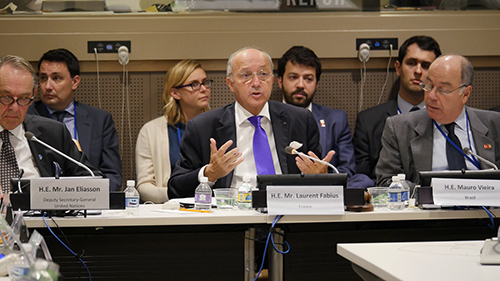 A Technology Facilitation Mechanism that seeks to promote science, technology and innovation to achieve the 2030 Agenda for Sustainable was launched at the United Nations Sustainable Development Summit. 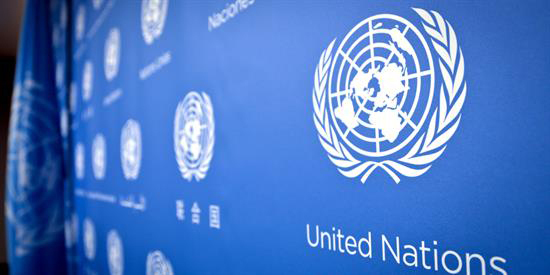 In the lead-up to and during the United Nations Summit for Sustainable Development, over 40 initiatives from a range of stakeholders were registered in the Partnerships for SDGs platform, bringing the total number to 1751. In the run up to the 21st Session of the Conference of the Parties to the UNFCCC (COP21), the Higher Education Sustainability Initiative (HESI) will meet on 14 October at UNESCO Headquarters in Paris to take stock of progress made since Rio+20 by higher education in the advancement of sustainable development and climate change. 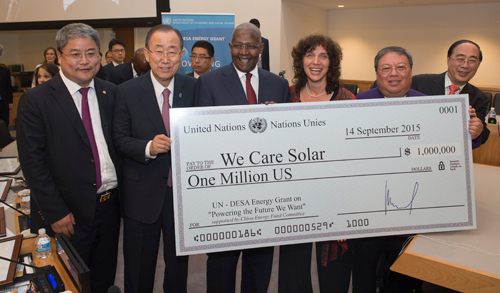 The first-ever US$1 million UN-DESA Energy Grant was awarded to We Care Solar, a non-profit organization, to enhance and expand the use of its 'Solar Suitcase'. By making solar power simple, accessible and affordable, this device allows for the provision of electricity for medical procedures during childbirth in many developing countries, helping to avoid life-threatening complications for mothers and children.